Okay, so I’m really into making spiralized potato breakfast bowls. While sweet potatoes are pretty much accessible year-round, I like to save them for when there are leaves on the ground and that crispness in the air. I love using potato noodles in breakfast bowls, because they are SO much more fun than regular cubed potatoes. Whenever I order omelettes or breakfasts at restaurants and the side options are “breakfast potatoes” or “toast,” I always pick “toast, not buttered.” I do this, because I rather have a slice or two of whole wheat toast than about 2 cups of cubed potatoes fried or cooked in half a stick of butter – ick! It’s rare you go to a restaurant and get a reasonable portion of potatoes with your breakfast – and since I’m an all or nothing kinda gal, I can’t have them on plate – because I’ll eat them…. all! Anyone else like that? 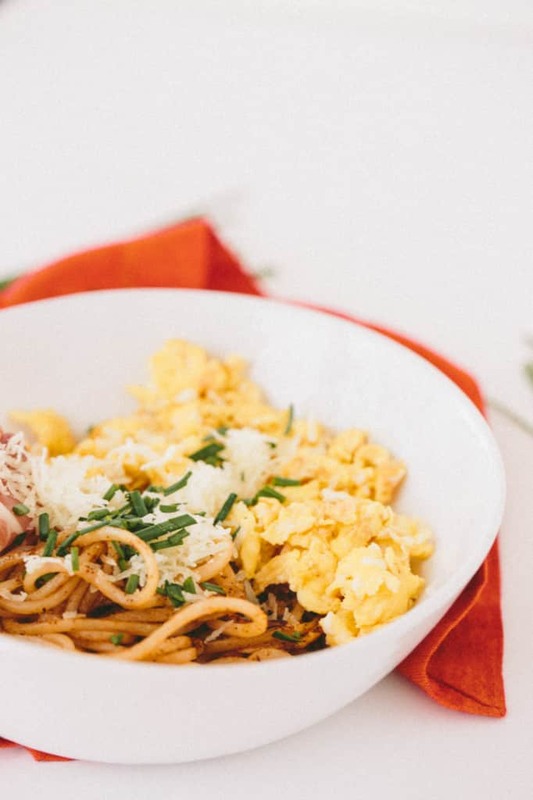 When you spiralize one small red potato, you get a bigger bang for your buck – you get about a cup of potato noodles. If you were to translate one red potato into cubes, it would yield about 1/2 cup. Plus, you’re eating real, whole foods. A potato grows from the ground. Now, I recently went to a Spanish themed cooking class and ever since then, I’ve been craving Serrano ham and manchego cheese. I actually bought some to keep in the apartment for a spontaneous wine and cheese night, but instead, as I was thumbing through my refrigerator for blog recipe inspiration, I pulled out the ham and cheese and ended up with today’s recipe. 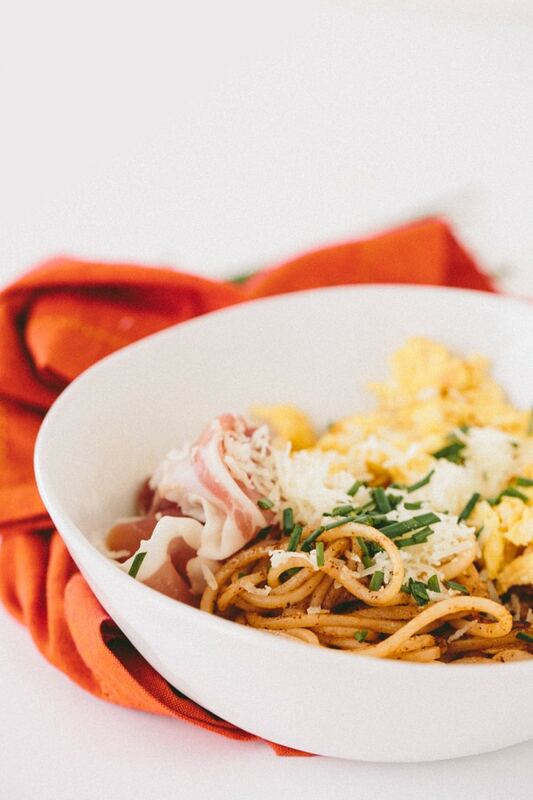 Now, if this dish doesn’t satisfy your tastebuds, I don’t know what will – the sweet, nuttiness of the manchego cheese with the fluffy scrambled eggs and slightly salty ham pairs wonderfully with the chili powder and garlic seasoned potato noodles. 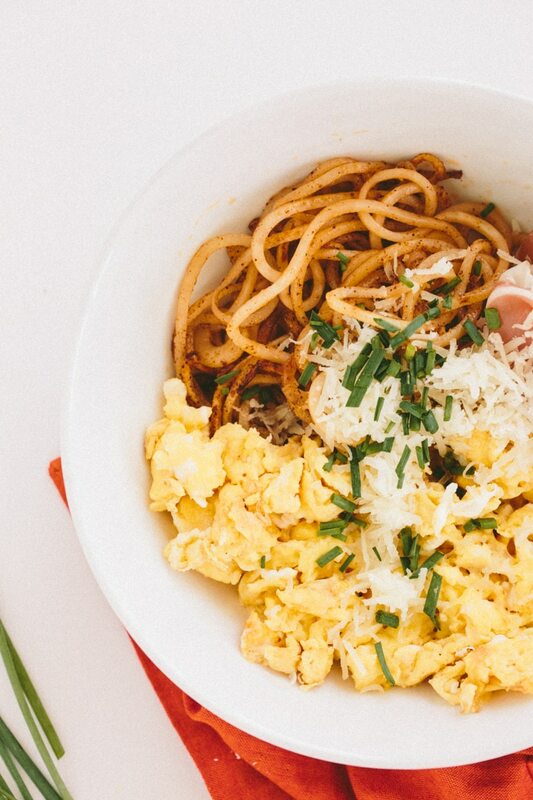 This potato noodle bowl would make a great hangover breakfast (ha! 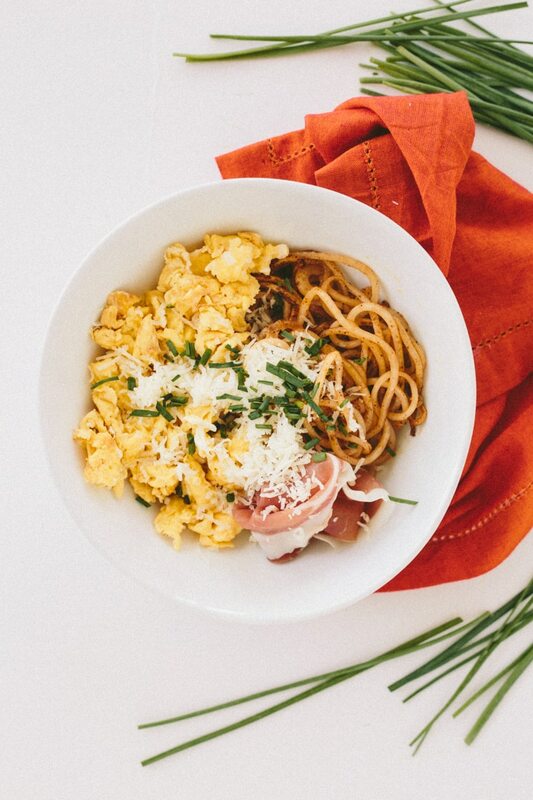 ), a birthday brunch or just one of those cold fall days when all you want to do is curl up with a bowl of heartiness. Place a medium skillet over medium-high and add in the olive oil. Once the oil heats, add in the potato noodles, season with salt, pepper, garlic and chili powder and toss. Let cook, covered, for 7-10 minutes or until cooked through. Once cooked, divide onto two plates and cover to keep warm. 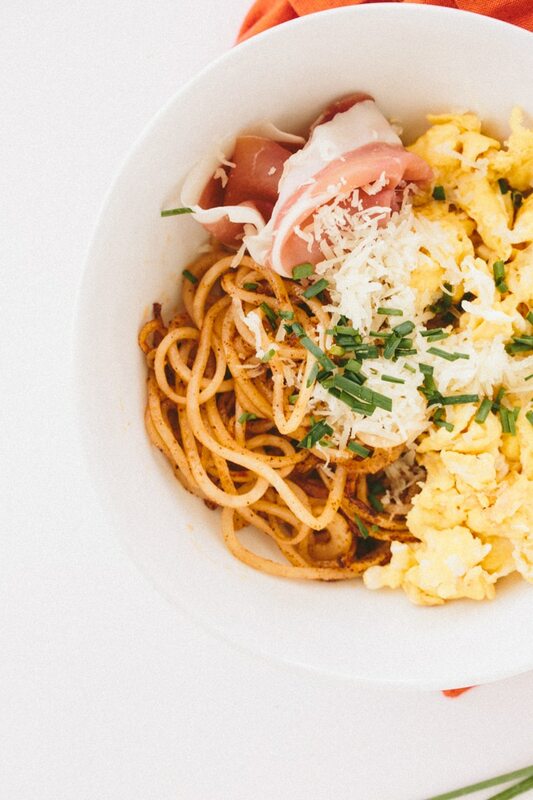 While potato noodles cook, beat the eggs and set aside. Once potatoes are done, immediately add in the eggs and scramble them. Divide the eggs onto the plates with potato noodles. Then, place 1 piece of Serrano ham per plate. Dust each plate with manchego and garnish with chives. Serve. Loving the bowl meals, keep it up!! Hope your feeling better, have a great week. What kind of shape does Blade D make? 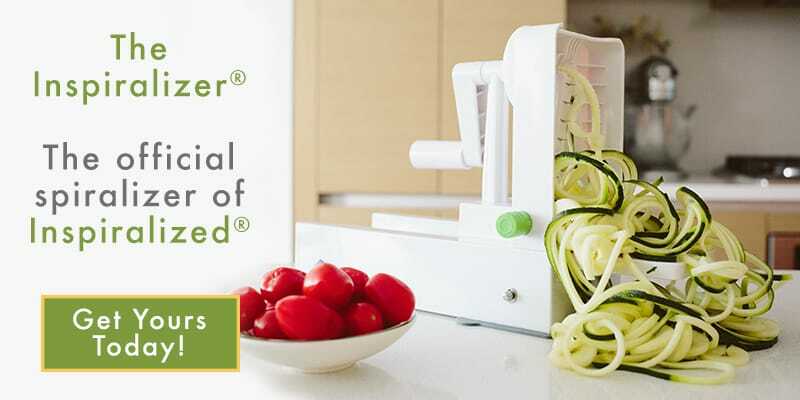 This must be a new spiralizer, because I don't have a Blade D? This sounds wonderful, although I don't know that I can find Serrano ham. Maybe when the new Sprouts opens up on our side of town.